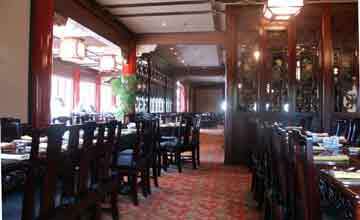 After a long hiatus, we returned to Nine Dragons restaurant, in Epcot's China Pavilion. The recently revised lunch and dinner menus drew us back, and now that we've sampled, we'll be coming back for more! While we were able to list those new menu items in the latest edition of PassPorter Walt Disney World, we hadn't had a chance to taste them. Naturally, this also meant we couldn't update our old ratings. Well, after a totally delightful lunch in late January, we can finally revise those numbers, in a big way. Jennifer's rating goes from a "2" to a "7," and Dave's goes from a "4" to an "8!" The reason for the change is that the revised menus offer a wider range of out-of-the-ordinary offerings, and the preparation and quality finally justify the high, Midtown New York City prices. While you'll still pay far, far less in Chinatown or the local strip mall, you'd be quite fortunate to find a local Chinese establishment that compares. What has us kvelling (rhapsodizing) so much? Let's tell you about our recent lunch, where we went sampling-crazy. Not only did we order the lunch sampler for two ($29), but we also ordered three items from the dim sum menu. Either would have made a full lunch, so as good as it all was, we couldn't finish the half of it. Jennifer's favorite was the sautéed beef and peppers. Old-time Cantonese restaurant goers might just think "pepper steak" and move on, but even jaded Chinese food fan Dave agrees that the julienned red and green peppers and onions, and the flavorful, well-balanced brown sauce rose above commonplace versions. The third item took a back seat on both of our lists. The shrimp with cashew nuts was just "OK." Still a cut above average, but this was a case where they didn't find a way to distinguish the medium shrimp, diced celery and cashew nuts in a light brown sauce. 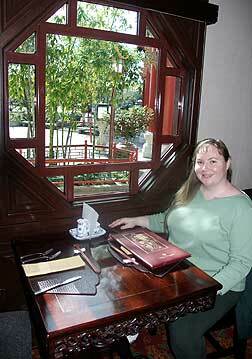 Between the soup and entrees, we had several dim sum selections. Dim sum, or "touch the heart" is Chinatown's version of Spanish tapas and Japanese sushi. These small (usually) appetizer-sized portions are a staple of Chinatown lunchrooms. The menu at Nine Dragons offers nearly two dozen choices, including a variety of steamed and fried dumplings, spring rolls, stir-fried and pickled veggies, traditional sweets like deep-fried sesame seed balls and steamed buns with red bean filling, savory meats (crispy roast duckling, chicken breast marinated in wine, spicy beef shank), steamed tofu with shrimp, and several noodle dishes. Prices range from $3.95 - $14.95. Our Chaozhu steamed dumplings ($3.95) were plump, translucent packets of rice noodle dough stuffed with a flavorful mixture of minced veggies and peanuts - no dipping sauce was supplied, or needed. A cold plate of sweet and spicy cucumber salad ($3.95) was the perfect between-item palate-cleanser for our sampling odyssey - its sugar, rice vinegar, shredded ginger and red pepper marinade was perfectly balanced for Dave's taste, but a mite spicy for Jennifer. Finally, the crispy duckling ($7.95). The huge portion of carefully cut-up, bone-in duck approached perfection. All too often, crispy duck is incinerated in deep fat to produce a thick, crunchy, greasy crust and dried-out meat, or comes out with browned-but-soggy-and-fatty skin. Here, the duck came out golden brown, with light, delicately crisp outer skin, nearly no fat beneath that skin, and wonderfully moist and flavorful meat below. While the duck was accompanied by the traditional dish of hoisin dipping sauce, it was hardly required (dip sparingly). Whew! This is the new benchmark by which Dave will compare all Chinese duck. Now, either the sampler meal or the three dim sum items could have made a satisfying lunch (well soup and four or five dim sum would have been heaven), but we were here to sample and scout. Dim sum is the perfect solution for a table full of food-loving friends. While the little plates aren't wheeled around on a cart, Chinatown-style, you can keep ordering item after item, as your whim and appetite permit. The dim sum lunch certainly offers more adventure than the regular menu that lists familiar Cantonese and Szechwan favorites like sweet & sour pork, Kung Bao chicken, moo gu gai pan, scallops with black bean sauce, and mu shu pork. Still, if the familiar beckons, be assured that it won't disappoint. Next on our agenda is a dinner at Nine Dragons. You see, after the wonderful duck at lunch, Dave can't wait to try the Three Course Peking Whole Duck Dinner, which is served only at dinner. What's remarkable here is that you can order this Chinese classic at whim - the few restaurants that serve the "real thing" often require a 24-hour-in-advance order. Alas, the selection of dim sum at dinner is much smaller, so you just may have to make two visits to Nine Dragons to sample its many pleasures.